May 29, 2015 / admin / Comments Off on Emergency Fitness #1! We all know that emergencies can be absolutely exhausting and physically demanding, to say the least! It all starts with the adrenaline that rushes through you – and that alone can take a toll on your body. But it usually doesn’t end with just an adrenaline frenzy! There is usually many hours of walking, building, shoveling, carrying, lifting and so much more that is required of us during an emergency. Time to rest usually doesn’t’ come until long after the emergency has subsided. So … PHYSICALLY preparing for an emergency should be on the top of our “MUST DO” and “START NOW” list! 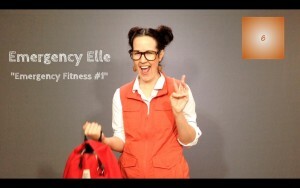 Invite your entire family and friends to join you and Emergency Elle, in getting physically ready for “that” emergency that WILL come our way! Equipment Required: Backpack, water bottles and walking shoes. Emergency Elle uses a Large Backpack from Emergency Essentials.